The president sat down for a chat with three top creators from the website where anyone can be an internet star, especially if you're a cat. Ingrid Nilsen of YouTube fame today joined two other popular video stars in an annual tradition at the White House: a chance to ask President Obama any question. Nilsen, the out internet sensation who confesses her claim to fame is not politics but “my beauty hacks and lifestyle tips,” were live this afternoon with Destin Sandlin and Swoozie. Each took turns on their own makeshift set in the East Room of the White House, talking face-to-face with the president about issues that are important to what some have dubbed the YouTube generation. "I'll be asking the President questions about a range of issues," wrote Nilsen in an email blast advertising the event. "And all week, we've been gathering questions from our YouTube fans to hear what issues they want to raise. "This interview is for all of us... This is a huge chance for young people to get our voices out there." Swoozie, the Orlando vlogger who bills himself as "a Pro DOA player, music/film lover, freelance ninja, professional cuddler, ex pokemon photographer, writer and animator, started with a question about the minimum wage, and Obama made it clear he can’t make it $500 an hour. Although that was meant in jest, he did answer the question seriously and acknowledged the issue is a nationwide problem. 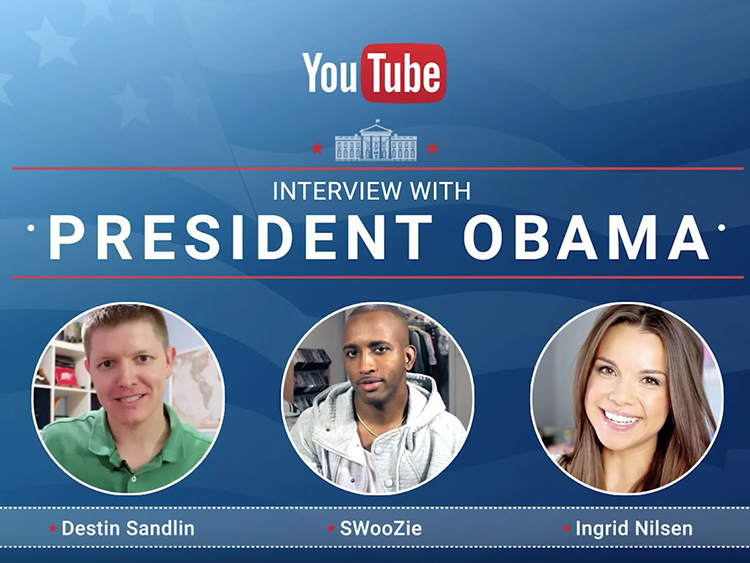 Swoozie moved to a question about the election, and if he was embarrassed by Donald Trump. The president said it’s early in the season, but repeated his comment in the State of the Union Address, decrying the fact “people can just make up facts,” and the need “for some basic boundaries where facts are facts and we don’t assume malice on the parts of other people." In a lightning round, Obama revealed he still hasn't seen Star Wars: The Force Awakens," and his favorite Star Wars film was 1977's Episode IV: A New Hope, which he called "Episode One." Watch the video of today's live event by clicking below.